Do you know? 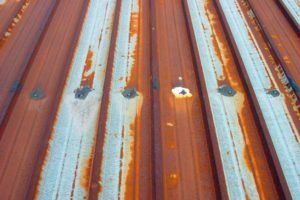 Metal shavings created by installing a metal roof can be a problem if not addressed daily. 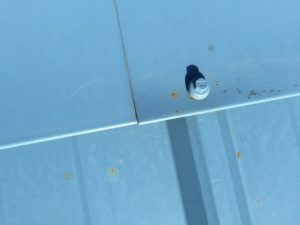 When the roof is screwed down there are tiny metal shavings created that typically land on the roof and stick because they are hot. The installer should sweep or blow the roof off every afternoon during the install to eliminate the shavings. Within 24 hours the moisture in the air can cause the shavings to start rusting. 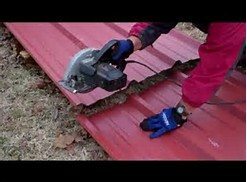 It is also recommended that all cutting of panels should be done on the ground to help eliminate any shavings that can be created from cutting the metal. This is a little problem that can create a big problem if it is not taken care of properly. Do you know? Pressure treated wood does not work well with metal. The reaction to the chemicals and copper which is a dissimilar metal in the pressure treated wood cause the metal to rust. It is recommended that you always use untreated pine or spruce stringers to attach the metal to. Do you know? It is not recommended to use a circular saw to cut Galvalume sheets. The high RPM of the saw blade generates heat and melts the Galvalume coating. This will cause what we call edge rust. When the material is cut properly with Tin Snips, Nibblers, Turbo Shears or any low rpm cutting device the Galvalume material will wrap around the cut. Galvalume material does what we call self-heals itself when cut with the proper equipment.